We had four great gigs during February and March. On the 24th of February we were in Kawakawa for the Variety Charity Concert to raise funds for the Kawakawa Vintage Railway. Shirley May had once again organised a great lineup of artists to entertain a small but appreciative audience. These included BOI College Kapa Haka group with a rousing performance to kick things off, the multi talented Diane Brown, Roger McLean family string trio, vocalist Daniel Morrison, Jack and the Boys playing country rock and Jack Tane another well known entertainer around Whangarei and Northland. The show was held together once again by MC John Carter. A great day had by all for a very worthy cause. We wish Frank and his team the very best. They are doing a great job of keeping the history of Vintage Rail alive. On the 6th of March we were at the Kamo club entertaining the Dance Section on their 19th birthday celebrations. Wow where did those years go. So next year will be the big “Two O”. Hope we get an invite to that one. Always great to play for these guys and watch some awesome dancing. On Sunday 10th March we did something a little different and joined some of the Northland country music clubs for a day at the Towai Tavern. A selection of players and singers rolled up to enjoy the day and to be part of a fantastic day of country music. A big thank you to Dennis Pabirowski for supplying and operating the sound system for the day. A great day with great friends and great food supplied by Towai Tavern management and staff. This may become an annual event. 43 Holes, Hired Gunz and Koltrain. Koltrain were our backing band for Saturday night and did an awesome job as did all the bands during the festival. It was such a pleasure to meet up again with the Te Paa boys Arbie, Richard and Chad and Robbie Katipa jnr amazing musicians and so talented. Festival goers were not disappointed. 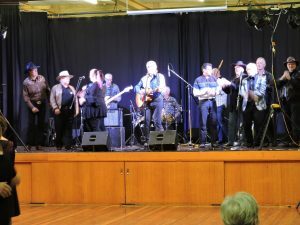 Some of the fantastic acts on display were; country legends Dennis Marsh and Brendan Dugan, NZCMA patron Dennis August, Coopers Run, Kylie Austin, Carleen Still, Grant Reha Timoti, Joy Adams, Te Whanau, Derek and Lynn Evans, Spellbound, Nelton and Faye, Debz Standen, Bruce Greaves, Peter Frew and of course the man himself Craig Robertson. Also a big thank you to Ted Viscovich and Peter Still on sound and Rolleston Motel for the accommodation. Very much appreciated. And that was about it for February and March everyone. Hope to catch up with you all sometime somewhere along the road. To all those in the Auckland area we will be at the Henderson RSA on the 28th of June 7pm till 11pm. Before that we will be at the 30th Bay of Islands Country Rock Festival on Saturday and Sunday the 11th and 12th May with “The Mountain Mist Band”. Really looking forward to performing with Richard, Ian and Tiny again. Until then remember to take care and to keep it country. We had a great weekend. Thank you to everyone that supported us by buying cds and coming over to chat. We heard some great stories over the weekend. Some we can’t repeat. It was great to catch up with so many friends especially Lloyd and Nancy from Hawera, Lorraine from Whangarei and Gail and Ngatoko Kupe from Fielding. It was so nice to see you all again. Also a big thank you to Beth and Andy Watson for providing us with accommodation over the weekend. What a beautiful home you have. Beth and Andy are very busy people. Andy of course is the Mayor of Marton and together they own “Spookers” in Auckland which is where Beth had to go for the weekend to work. Don’t worry Beth, Andy took care of us wonderfully. Hope to see you both next year. Thanks John for a great weekend. It looked as though it was a record turnout. Congratulations to all your support team as well. Fantastic job. Great music, great food and great friends what more could you want. We also send our well wishes to Ron Austin. Hope you are on the road to recovery Ron. Couldn’t imagine a country show without yourself and Pam there. That’s about it folks. Our next festival will be in Thames on the 23rd of March with my cousin Craig Robertson. Also hope to be at the Bay of Islands Country Rock Festival in May with “The Mountain Mist Band” and on Sunday the 24th of February we will be at the annual Kawakawa Vintage Railway concert. Then on the 6th of March we will be at the Kamo Club to celebrate the Dance Sections 19th birthday. So look forward to seeing you at one of these gigs. Until then take care and remember to keep it country. Wow. The year has just flown by once again. Here we are again getting ready to finish 2018 and looking forward to all that is in store in 2019. We would like to thank everyone that has sent their kind wishes to Annette while she has been unable to sing. It is most appreciated. Since my return from Australia in early August we have slowly been getting back to performing as a duo. 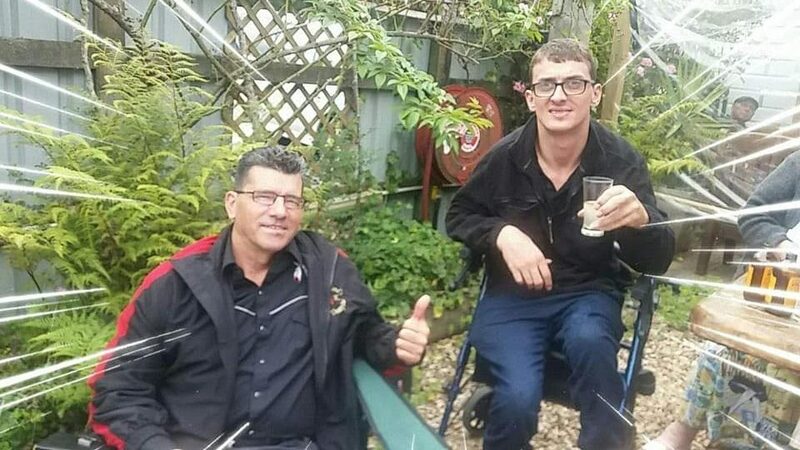 This has included a fundraiser for the Whangarei Special Olympics held at the Kamo Club and a guest artist spot at the Northern Wairoa Country Music Club’s fundraising concert for the Northland Rescue Helicopter held at the Dargaville Club. Both events have raised well over $1000 each. There was a great turn out for both of these shows with the crowd at each one enjoying the afternoon and really getting into the spirit of the day. 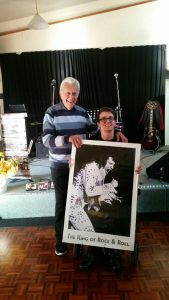 Alex Dickson getting a great round of applause for his rendition of “The Gambler” from the audience at the Special Olympics show and also receiving a “near life size” Elvis poster from his good friend Bill Pomare. I would like to mention at this stage how sad we all were to farewell Bill and Fay Pomare who left Whangarei in early November to join their family on the Gold Coast. We will really miss these guys at our gigs. Thank you so much for your support over the years. 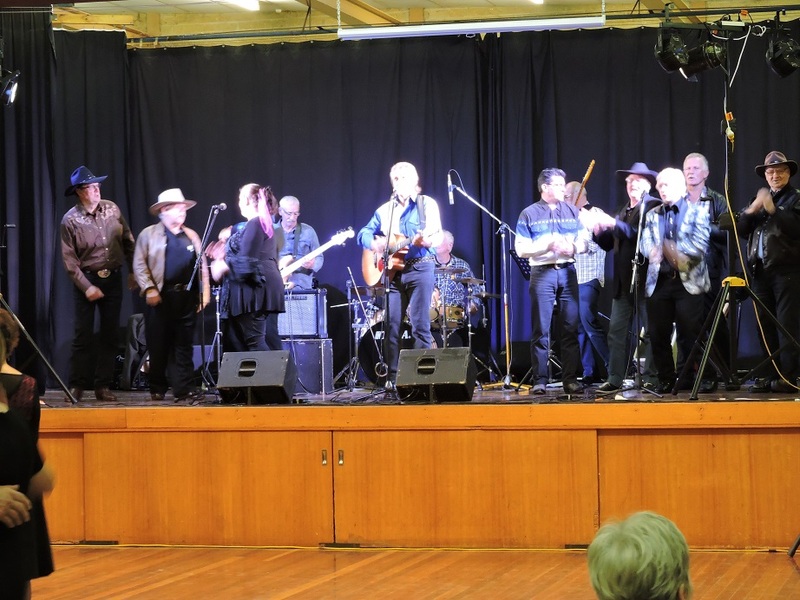 The Dargaville show was ably M.C.ed by Leeanne Dunn, who travelled up from Matamata, with singers from the club adding to the entertainment backed by Bruce Stenhouse and his band, Jim Wallace Snr (a very popular performer), Peter, Jack and Kerry with Ken working the sound. The crowd really getting in to the medley which we now regularly perform at shows. On the 23rd of November we did our first evening gig together for quite a few months with a performance at the Whangarei RSA. Once again the crowd was awesome and it was great to see so many familiar faces either happy to sit and listen or out on the dance floor. The following Tuesday we were entertaining for the residents of the Kamo Retirement Village. This was another enjoyable afternoon with everyone singing along to all the old familiar songs.Tuesday evening we were booked to entertain for members of the Whangarei Friendship Club, formerly known as Probus, at their end of year dinner held at the Kamo Club. We would like to thank Gloria and Lyn respectively for inviting us to perform at these two events. 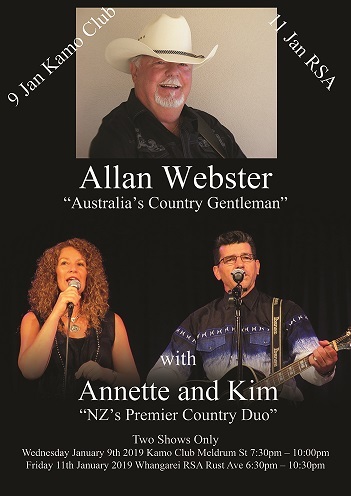 Heading into January we are very excited to have our good friend Allan Webster here in Whangarei performing at the Kamo Club on Wednesday the 9thand at the RSA on Friday the 11th. Allan and his wife Maureen have been wonderful to us when we visit Aussie. Taking care of us and our Aussie dad Dale whenever we are travelling through.Allan is a seasoned singer/songwriter beginning his career in the music industry back in the sixties as a teenager forming a Rock ‘n’ Roll band with his brother and a couple of mates. They performed alongside the likes of the Beatles and Gerry and the Pacemakers at the Cavern Club. Allan will have his grand daughter, Melody, with him to perform as well. Melody is a very talented singer and has an amazing voice. Don’t miss these shows. There will be dance music so bring your dancing shoes. On Wednesday the 5th December we performed our final gig for the year at the Kamo Club Dance Sections Christmas break up. What a great night this was with a good sized crowd enjoying the evening’s music. It was so nice to see everyone out on the dance floor enjoying themselves. Some had even donned a little Christmas bling to celebrate the occasion. You may see a few photos doing the rounds on Facebook. Thank you to Denise and John and the Kamo Club for inviting us to perform. We look forward to being at the club in 2019. And a little shout out to our family members who had ventured out to support us. It was so nice to see you all there. On the 18th 19th and 20th January we will be at the Marton Country Music Festival. 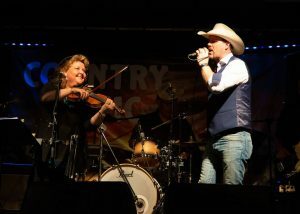 John has a great line up of country artists performing with Headliners, Noel Flynn from Ireland, and our very own fiddle player extraordinaire Marion Burns. It looks as though camping spots are filling fast with no powered sites left at the venue. Sunday 24th February we will be in Kawakawa for the Railway concert and on March 23rd and 24th we will be joining my cousin Craig Robertson for the 5th Thames Country Music Festival. Craig is getting together a fantastic weekend of country music. So we look forward to catching up with you all at one of these events. Finally we would like to thank everyone for your support in 2018. We wish you all a Very Merry Christmas and a safe and happy and country music filled New Year. Take care and remember to keep it country. During July and August we were to travel to Australia to perform at several festivals and shows. As you all are aware now due to health reasons Annette was forced to remain in New Zealand and rather than disappoint our fans in Australia it was decided that I should continue the trip by myself once we had contacted all the convenors and organisers to make sure they would still be happy to have just Kim. Which, thankfully they were. Before I continue I must thank a few people for their assistance during the trip in providing gear, setting up gear, organising gigs, providing accommodation and transportation and a whole lot more. Firstly our Aussie dad, Dale, when we count our blessings in life we count Dale twice. Dale was my driver, roadie and marketing manager to name just a few. Don’t know what we would do without him really. Di Jones and Kerran Keats for the sound system and home style accommodation, Nancy and Reg Walker for all the help in arranging the Geelong gig. Much appreciated. 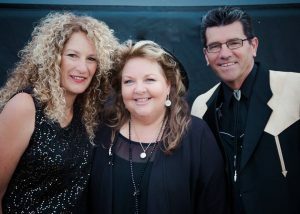 Bidge and Barbara Boyd for the Colac and Camperdown gigs. Very inspiring to see the work you both do. Our thoughts are with the drought stricken farmers around Australia. Maureen and Allan Webster for their friendship and help in making our trip successful. Also very much appreciated. And to Allan and his great band “The Country Gentlemen” Nev, Henry and Drew for their support at Adelaide. That was a blast. Rosina at Club Barham for her understanding and support at the Barham Country Music Stampede. We all wish you the very best in your new endeavour. We will miss you. Gary and Sally at Colonial Motel for the accommodation at Barham. Roz and Craig Giles once again another great festival at Lockington. Jenny Keele for the accommodation at Lockington. Thank you Jenny for supporting Roz and Craig and making us feel welcome in your home. The heated wheat packs were lovely. Sandy and Graeme Smallacombe at Southern Country Music club Adelaide so nice to meet you both. Bev and Beryl at Kyvalley Morning Melodies lovely to catch up again. Thank you to you all for your help and support. We look forward to doing it again soon. On Thursday the 26th July I landed in Melbourne ready for my three week stay in Australia performing at several festivals and shows. I was met by Dale and we headed up to Barham for the three day festival. Beginning my first set on Friday in the newly renamed Loddon room with a sit down audience was a bit nerve wracking not having my sidekick there to help run the show and tell me what to do. It took a little time to get used to the fact Annette wasn’t there and I had to take it one set at a time. But we made it through and it was great to catch up with old friends and to make some new ones as well. The crowd was wonderful and all asked how Annette was doing and sent her their best wishes for a speedy recovery. Other acts performing at the festival were New Zealand’s Craig Adams and Dennis Marsh both very popular acts at the festival. Well known Australian country singer Alby Pool along with popular Aussie artists Allan Webster, Sandie Dodd, Sharon Benjamin, Marie Hodson and new comers Shelley Jones Band and Danny Stain. Ably supported by “The Southern Cross Band” Anthony, Colin and Bob. Nothing was ever a problem for these awesome guys. It was great to work with you all again. A great weekend was had by all topped off with a hilarious finale that saw some great impersonations, improvisations and costumes take to the stage. On the Monday I had the Monday Madness to do at the club before heading off. This is a fun afternoon of raffles and music run by the club and is great entertainment especially if you were lucky enough to win a prize. Not this year either for me. From Barham we headed to Echuca and a couple of nights with Di and Kerran who kindly supplied the sound system for the Monday Madness and would also help me out at Kyvalley for the Morning Melodies on Tuesday. A great morning was had by all that attended in support of their local community. shopping at Cobram, Tocumwal, where we diverted to take a look at the Blow Hole. This is a hole in the ground said to be around 30mtrs deep and linked to the Murray River. Water flows from it generally when the river is low. Then on to Nathalia and finally ending up back at Di and Kerran’s. invitation and to Reg and Nancy for arranging it all plus the accommodation. Fantastic. Thank you so much. We also had a lovely meal together after the club day. Monday was a free day and we decided to stay around Geelong before heading to Colac. So it was off to Portarlington for a quick look at where Dale’s father used to take the family on holiday. A nice hot chocolate was just the thing to warm up after a brisk walk along the jetty. It wasn’t exactly sizzling. We then headed down to Queenscliffe at the mouth of Port Phillip Bay and the entrance to Melbourne harbour. After a night spent with Grant and Cheryl in Geelong we headed down the Great Ocean Road where we would eventually head in land at Lorne and the next gig at Colac. On the journey down we saw some awesome scenery and got some great photos. Millicent to meet up with Maureen and Allan Webster and to prepare for the gig with Allan at the Millicent and Districts Community Club on the Friday night. A small but appreciative crowd turned out to enjoy an evening of country music from “Allanette and Kim” the new duo taking country music by storm. From Millicent we were on the last leg home to Adelaide and a guest appearance at the Southern Country Music Club on Sunday the 12th. The support band for this show was Allan Webster and The Country Gentlemen band, Nev, Drew and Henry. It was a fantastic afternoon with this awesome band. This is also a great venue with a bbq lunch available or sandwiches and cake if you prefer and licensed as well. The dance floor was seldom empty. It was also nice to catch up with David and Marilyn and Joe again. Also some of Dales family attended the afternoon to hear me sing live for the first time so that was pretty cool. Thank you guys. And that brought to an end my Aussie tour. Made it. It was sad goodbyes to Maureen and Allan and the band as they had to head back to Millicent. The next couple of days were spent chilling out and trying to pack. We decided that it may be best to freight some of the stuff home rather than pay for extra baggage. Can’t wait for it to arrive. Early Wednesday morning I flew out of Adelaide heading for home. And that folks was about it. We will catch you all somewhere sometime in the future. Remember to take care and keep it country. Well it had been about 3 years since we last performed at the Bay of Islands Country Rock Festival and we were certainly looking forward to being back for the 2018 festival and performing with “The Mountain Mist Band” once again. We had decided to busk as well and although the weather was a little inclement we managed to get a few hours in on Friday but Saturday was a washout. However we were looking forward to our weekend gigs and catching up with acts that we have not seen for a while. The Headliners for the festival from New Zealand were The Toner Sisters and the amazing Warratahs. And from Australia Michelle Plozza. We enjoyed successful gigs at the Ex-Servicemen’s Club, Paihia Sports Bar, Duke of Marlborough and the Kingsgate Hotel over the weekend. With only a couple of practices under our belts we were more than happy with the end result. The guys did an awesome job as usual. Thank you Richard, Tiny and Andrew for supporting us. Andrew stepping up to handle all the lead breaks as Ian was unable to make it up to the festival. But he had given us full warning that he may not be able to make it. We missed you Ian. It was great to catch up with friends Raymond and Esther Solomon, Gray Bartlett and Brendan Dugan, Marian Burns and Matt Zarb, Carylann, Craig and Katrina Adams, Robert Antonio and his wife and my cousins Craig and Donna Robertson. Before we knew it the weekend was over and we were getting ready for our next engagement. 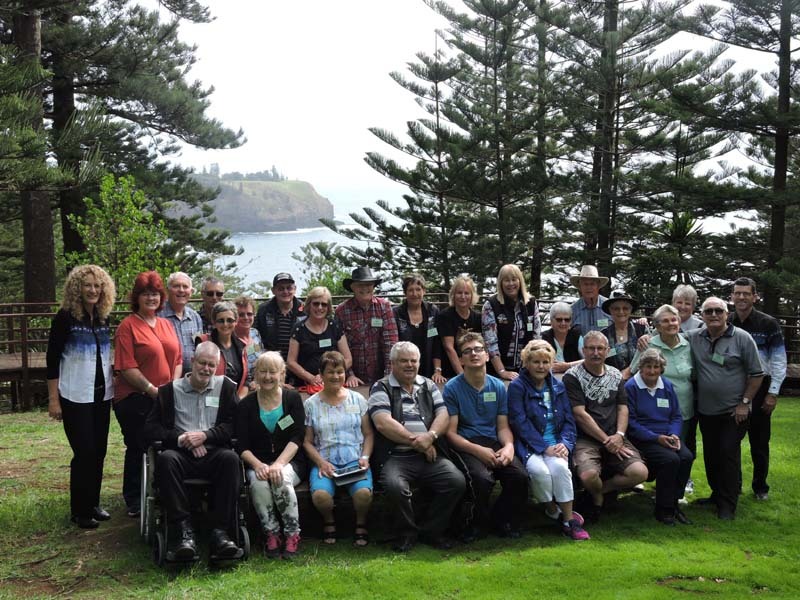 We had not intended to take a tour group to Norfolk Island in 2018 as we had made the decision in 2017 to make that our final trip to the festival. However the call came from The Travel Ctr on Norfolk Island about 3 weeks out from the festival to help fill a second charter on a 47 seater Chatham Air convair 580 turbo prop aircraft to celebrate the 25th anniversary of the Norfolk Island Country Music Festival. This would be the first time this type of aircraft has been used to bring people to the festival. It was too good an opportunity to pass up. On short notice we managed to get a group of 13 adventurous people to join us for this inaugural flight. What an adventure it was as well. It was like stepping back in time. We had a great flight up and back and were well looked after by the Chatham Air staff. It is hoped Chatham Air will start regular weekly flights to Norfolk Island if it is feasible. We certainly hope so for the sake of all our friends on Norfolk who desperately need the regular service from Kiwi. With little time to organise activities for the group on Island we decided to play it by ear and arrange things as we went along. We had organised 3 gigs at the RSL during the week and a half day tour was included as part of the tour. A BBQ was organised at short notice before one of the evening shows and Ken made an emotional speech during the proceedings which was very touching thanking Alex for phoning and asking if he and Elaine would come on the tour with him. We also had an hilarious afternoon of mini golf with the men’s winner being Allan Lappin and the ladies winner after a playoff hole was required being Jo Dickson. We also had a wonderful picnic lunch at Cooks memorial. This is an amazing spot and the weather was magical. Our good friend Dids Evans allowed our group to visit their property at Flagstaff which overlooks Kingston and the group was blown away by the views and the generosity of Dids and his wife Gaye. It was so nice to catch up with all our friends on Norfolk Island and we hope to see you all again soon. It was such a great week of country music with Aussie Headliners Troy Cassar Daley and Travis Collins with guest artists Fanny Lumsden, Johanna Hemara and 2017 Trans Tasman Entertainer of the Year Mason Hope and Kiwi Headliners Dennis Marsh and The Topp Twins with guest artists Farmer and Doublet, En-Tranzet and NZCMA Intermediate Entertainer of the Year Jaydin Shingleton. Backed once again by 4PLAY and The Huckleberries respectively with BVs by Echo ‘n Harmony, Sharon and Rosemarie. And not forgetting the local Norfolk Island band which helped begin the first festival 25 years ago reunited for the celebrations “ The Nightriders”. The weeks celebrations were topped off with a performance by Aussie singer Shannon Noll as a special treat for all the volunteers that have made it possible over the years for the festival to reach the 25 year mark. Well done everyone. As mentioned in our previous Newsletter we are getting ready for our trip to Australia at the end of July beginning of August for the Barham and Lockington country music festivals and are very excited to be doing a couple of guest spots at country music clubs in Geelong and Adelaide. Follow this link for dates and times plus read about the Morning Melodies and Evening Shows we will be doing with Bidge Boyd and Alan Webster along the way. Before then we will be on our first visit to the Henderson RSA on the 29th June. Hope to see you at one of these venues. Until then remember to take care and to keep it country. We have had some great gigs during February and March. On consecutive months we have performed at the Whangarei RSA where we have had awesome support. Usually we do 3 1/2 hours starting at 6:45 and playing until 10:15 but on both occasions we could have kept playing until 11:00 as the crowd was having so much fun. There are some awesome dancers popping up at these gigs and it is fantastic to see. We also celebrated the Kamo Club Dance Sections 18th birthday on Wednesday the 7th March. Once again they put on a fantastic night which included some yummy birthday cakes. We hope to catch up with you all sometime during the year. We would also like to wish the Kamo Club all the best for their 75th Jubilee celebrations this coming Easter. We have just completed our Good Friday gig for the NZ Motorhome National Rally being held at Barge Park here in Whangarei. More than 500 Motorhomes are on site which should equate to over a thousand people attending the Rally for the Easter weekend. We had a fantastic night entertaining everyone. They all got into the spirit of the night by dressing country, singing along and dancing the night away. There were quite a few familiar faces in the crowd and it was nice to catch up with old friends. These Motorhomers certainly get around as we have met many of them on our travels around the country from the Bay of Islands in the north to Marton in the south. We must thank Tony Harrison for supplying the sound system for the weekend. There are certainly some challenges with mixing sound in a massive marquee and Tony did an amazing job. It was also nice not having to set up and pack down gear. We will see Tony again at the BOI festival in May. And speaking of the Bay of Islands festival we have had our first practice with “The Mountain Mist Band” for quite a while. We are looking forward to bringing some new songs and a different sound to the festival in May. We haven’t performed at the festival for about three years due to our tour hosting commitments to the Norfolk Island Country Music Festival which we do not have this year. We are certainly looking forward to performing once again with the band. We are also gearing up for our trip to Australia at the end of July beginning of August. So looking forward to performing again at the Barham Stampede and the Lockington Country Music Festival. We will also be doing gigs at Kyvalley, Geelong, Colac, Weerite, Edenhope, Millicent and Adelaide before we head home. If you are in Victoria or S.A. checking out our web site come along and join us at one of these gigs. We would love to see you there. More details to follow soon. That’s about it for now everyone. Take care and remember to keep it country. Welcome to 2018. We would just like to mention the last few gigs we did in 2017 before we move on to the new year. During Labour weekend we ventured down to Rotorua to entertain at the National Street Rod Association Nationals. The event was held at the Ngongataha Bowling Club and adjoining Domain. Over One Hundred and Fifty Hot Rods and Vintage vehicles turned up for the weekend. We were performing on Sunday afternoon and although many of those that had been participating during the weekend were a little leg weary it didn’t stop them from cutting a few moves on the dance floor. The them was country and along with the usual Cowboys and Indians there were an assortment of farm yard animal costumes out in force. Everyone had a great evening and we certainly enjoyed entertaining them and being entertained by them. We look forward to the next one maybe. In December we once again celebrated with the Kamo Club Dance Section at their Christmas break up. We had on our Christmas garb and even a red nose to brighten up the evening. Another great night with everyone joining in the festive spirit. Then just before Christmas we played our last gig of the year at the Whangarei RSA. A good crowd turned out for this night with a lot of new faces in for the evening’s entertainment as well. They danced the night away in good spirits. We will be back at both these venues in the New Year. Which now brings us to 2018. Happy New Year everyone we hope you all have had a safe and enjoyable festive season. We have already performed at two events this year. The first was a return to the Wai Worri Country Music Festival held at Phil Godfrey’s property at Aranga. This was our first time back for a few years. The weather was a bit dicey during the week with the area being hit hard on the Friday before the festival. The decision was made to move the event in doors to Phil’s wool shed to get everyone out of the weather. A large number of Mobile Homes arrived for the weekend and with the drive up’s included there was a good sized crowd for the weekends entertainment. Which apart from ourselves featured festival organizer Carlene Still, NZ Country Music stalwart Reg McTaggert and well known Northland country music identity Jim Wallace snr backed by the festival band Ray, Bruce, Ted and John. John also joining his regular band “The Tradesmen” to entertain for the Saturday night Hoedown. Both bands also supported the walk up artists for the weekend and did a fantastic job. The following weekend we were invited to be on Ray and Val Thurgoods Charity Concert in Te Awamutu. It was our first performance in Te Awamutu since 2014. Around 350 – 400 people came out to listen to a variety of acts put together by Ray to raise funds for the Bible Chapel. We were joined by Kay Tappin, Nancy Muller, Trevor Stevens, Merv McInteer, Grae Addison, Ron Samson and young Jade a very talented young lady that will be a great addition to New Zealand country music should she choose to continue. We wish her all the best. Thank you to everyone for your continued support. It was great to see so many familiar faces and to catch up with old friends again. It was also nice to catch up with my relations Peter and Rae Mutch and Sheryl Adams again. Unfortunately we have already had one disappointment in 2018 and that is not being able to join Allan and Maureen Webster on Norfolk Island for the “Count Us In” musical tour but as you are all aware circumstances were out of our control. We know Allan and Maureen and their tour group are going to have a fantastic week. We have so many great friends on the island that we have met over the years of touring who are more than willing to assist them during the week. Thank you Tara and Chrissy at The Travel Centre, Terence ( we miss you as well) and the team at the RSL, Louci for helping out with the gospel concert details, Desleigh for just being you thank you and all the artists that will be entertaining Allan and Maureen’s group during the week and giving their time freely. We appreciate your help very much and really do wish we were there. We are also looking forward to working with our band again this year “The Mountain Mist Band”. It has been a while since we have played together and we hope to be with them at the Bay of Islands Country Rock Festival in May with some new songs and a new sound. We will be one of the acts performing for the Mobile Home Convention to be held at Barge Park at Easter. So if you are a Mobile Homer make sure you have registered. We will also be returning to the Barham Country Stampede in July, the Lockington Country Music Festival at the beginning of August and will be doing a guest spot at Pleasant Sunday Country Music club at The Sphinx Hotel in North Geelong on the 5th of August all of these in Victoria Australia. 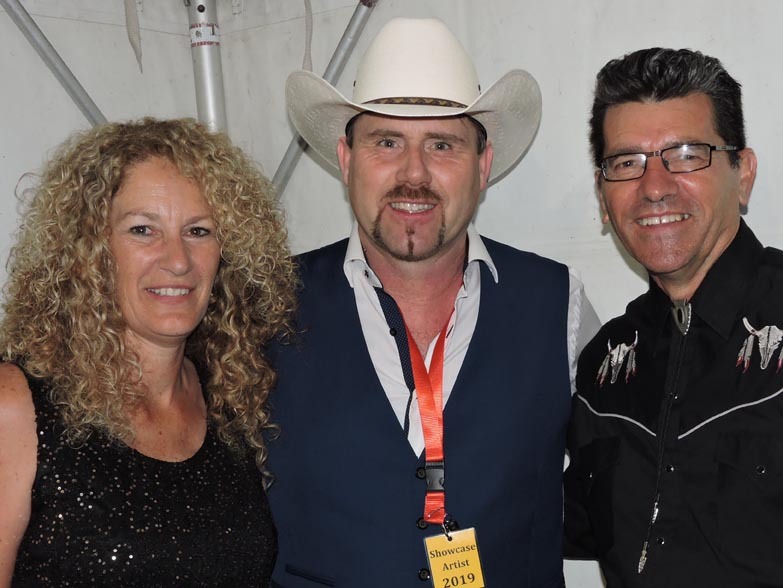 We will also be doing a small tour of the Victoria area performing Morning Melodies with our good friends Allan and Maureen Webster and Bidge Boyd as we make our way up to Adelaide, South Australia, to do another guest spot at the Southern Country Music Club on the 12th of August. It is going to be a busy and exciting year. Keep a look out on our web site “Show” page for upcoming gigs and also on our facebook page which Annette does a sterling job of keeping up to date on where we will be performing next. Once again have a great 2018 everyone and we will catch up with you all somewhere sometime during the year and remember to keep it country. On Wednesday the 26th July we departed Auckland Airport at 7:00am heading to Melbourne and on to Barham and Lockington for two country music festivals. We were met at Melbourne by our Aussie dad, Dale, who had driven over from Adelaide to spend some time with us. Once we had located the car and found our way out of the carpark we headed due N.E. to Barham and the Murray River. Our first stop being a little town called Lancefield for lunch and a breather. Then on to Elmore where I wanted to stop at the Visitors Centre and wouldn’t you know it they had closed for lunch. Well we waited for over an hour but no one returned so we counted our losses and headed on to Barham. We were booked into the Colonial Motel with hosts Sally and Gary Harmon it was great to see them again. Once we unpacked we headed to the Club for the meet and greet and a chance to catch up with the other artists and punters that had come in for the festival. Entertainment was provided by our good friends Dwayne Elix and Anthony Tenace. Anthony would also be doing the sound for all the artists in the Auditorium during the weekend. It was a great way to kick off the festival which would run from Thursday till Sunday and the Grand Finale, but more about that later. It was going to be a great week with the two main venues being the Auditorium where people could dance or sit and listen and the Myst room which was solely a sit down venue where artists could perform a more intimate show for the audience. For example Annette and I did a Patsy Cline & Jim Reeves set, a Western set and an acoustic set of well known country tunes which the audience could sing along to for some of our Myst room performances. It was so nice to catch up with old friends, Dwayne Elix, JR Williams, Wendy and Kerrie aka Justuss, Tom and Patsy Routledge, we first met Tom on our first trip to Barham and to meet some new friends also, Keith, Alisha and Caitlyn aka Golden Country, Rino Morea and Steve Eales. 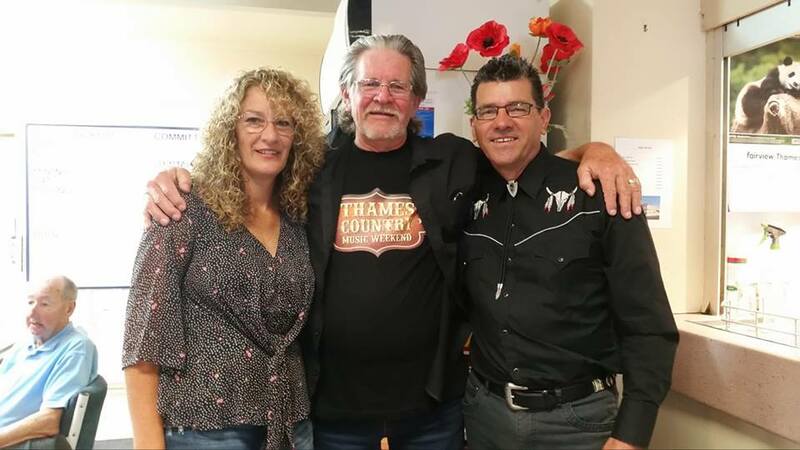 Kiwi’s joining us again for the July festival were, Dennis Marsh and Craig Adams two well known New Zealand country artists making a big impression at this festival. The event was run smoothly by Rosie Cimino and her team at Club Barham. Backing band for the festival was The Southern Cross Band with our good friends Anthony Stewart on lead guitar and Bartilo (Bob) Casella on bass. So nice to see these two talented guys again. The Sunday night Finale was its usual high standard with songs, skits and dress ups turning the audience to hysterics. Tom and Patsy Routledge did “ You’re The Reason Our Kids Are Ugly”, Steve Eales was an hilarious Mexican Bogan, Craig Adams did “Delta Dawn” in his now familiar alter ego Aunty Joy Adams. Check out facebook somewhere to get an idea of the standard required to perform on the show. 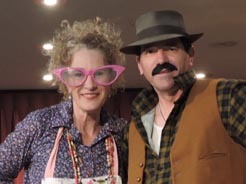 Annette and I did a Dave and Mable skit that had the audience waiting in anticipation for Annette to say the punch line. The finale was finished off with “Country Roads” and the Kiwi contingent performing a stirring rendition of Pokarekare Ana. It was then time for goodbyes and see you next time for artists and audience alike. However, not for Annette and I as, we had been booked to do the Monday Madness at the club the following day. This is an afternoon of raffle draws and entertainment. A great afternoon for all and a chance to catch up with our good friend Audrey, a Barham local who has supported us ever since we began performing at Barham. During the week it was also great to catch up with Rod and Margaret McCarthy, who may be joining us on Norfolk Island in January, Reg and Nancy, Vin and Moreen, Gerry and May and all our friends from Ballarat, hope to visit your club very soon and all the lovely people that not only danced to our music but to all the performing artists. Sally and Gary were kind enough to let us stay until the Tuesday morning whereupon we packed our gear and headed off on a three or four day adventure with Dale. From Barham we made our way to Deniliquin on the beautiful Edward River. Some of the major events held in Deniliquin are the Deni Fishing Classic, Cruising Nationals Hot Rod Festival and the world famous Deni Ute Muster. Check out the ute on a pole. Deniliquin is also part of The Long Paddock an old stock route running 610kms from Echuca-Moama on the Victoria border to Wilcannia NSW. We then went bush through the Barmah National Park visiting the Reed Beds Bird Hide and spotting a couple of Blue Wren’s and a Willy Wag Tail. It was an awesome drive taking about an hour or so as we made our way to Mathoura and on to Moama where we would spend the night. Wednesday morning found us heading to Shepparton via Kyabram and a stop at the Kyabram fauna park. The park opened in 1976 with 2 Kangaroos and 1 Emu and has now established itself as one of the most successful community operated non-profit Zoological Institutes in Australia. And it still has one very friendly Emu as Dale found out. From Kyabram we headed to Mooroopna and one of the best Antique/Second Hand stores we have come across on our journey’s which also happens to be next door to a home made chocolate shop. Once we had checked out both stores we headed to Wangaratta to find some accommodation for the night. Thursday morning we headed for the hills and Barbs favourite town. An old gold mining town called Beechworth. This is a beautiful little town with an amazing history and I’m sure that on a nice sunny day it would have been even more beautiful but it was absolutely freezing. Its only saving grace, apart from being Barbs favourite town, is that it is where Ned Kelly came from who Barb also liked. So we braved the cold and did the tour of the old buildings with our guide Ian. Also did some shopping here as well. Luckily we had brought our own thermals so we didn’t have to buy those. We also had time to visit Myrtleford where Annette caught up with Alex’s mum for a chat. Then it was back in the nice warm car and heading to Shepparton for the night. Another day was done. Friday we would be making our way to Lockington for Roz and Craig Giles’ country music festival Saturday and Sunday 5th and 6th August. We made our way up to Echuca via Elmore stopping at the visitors centre which was now open and a bit more shopping was done then on to Echuca to meet up with our very good friend Desleigh who had driven all the way down from sunny Queensland to see us. We met up for lunch at the 3 Gallahs Café then had a stroll around the Heritage Port area and did a bit more shopping. So much for trying to get the Visa down to zero. In the afternoon we headed over to Lockington, about 30mins from Echuca, to catch up with Roz and Craig and to meet our hosts Chrissy and Paul Weller who had kindly offered to put us up for the weekend on their dairy farm which was only a couple of minutes away from the venue. The venue was the Lockington and Districts Community Centre it had plenty of dance floor and seating area for everybody attending the festival, a great venue indeed. Again it was great catching up with artists we had met on our travels around Aussie. These included expat kiwi Kim Ritchie and her partner John, Allan Carroll who used to be the regular MC at Barham, Cameron Mason, Kerran and Di Keats, Rupe Adams, Olive Bice, Kinta, Ray Macartney, Jamie Nielson, Garry Hunt, Justuss nice to see you again girls and the Good Time Band Bob, Colin and John. Sound was once again provided by Anthony Tenace. The place was packed all weekend by people having a good time listening and dancing to country music with food and drinks provided by the Lockington Footy Club right till the very end. Everyone is looking forward to doing it all again next year. Our flight was at 7:00am Monday morning so as soon as we had said our sad goodbyes we headed to Melbourne to repack all our shopping, get a few hours’ sleep and be at the airport by 4:00am due to the extra security being put on because of the recent bomb scare. We said goodbye to dad and made our way to the A380 for our journey back home. And that was that. On Sunday the 14th May we flew out to Norfolk Island with a group of 25 people on our 10th anniversary Personalised and Exclusive Norfolk Island Country Music Festival Tour 2017. Well we actually flew out with 22 people as we had 3 of the group flying in from Australia. One Kiwi and 2 of our Aussie friends that would become honorary Kiwis for the week. We also had Annette’s nephew, Alex, joining us again in 2017. There’s no show without Punch. We also had Des and Sharon Fatt with us who were also celebrating their 10th trip with us to Norfolk Island. Little did anyone know that 2008 would be the beginning of a 10 year association with Norfolk Island and the descendants of the Bounty Mutiny. It has been an amazing journey in our lives. Once everyone was settled in to their accommodation we all gathered at the Paradise Hotel and Resort for our welcome dinner with entertainment from our good friend and local entertainer Lully Nobbs. It was a great evening and an excellent way to kick off the festival. On Monday morning we were up early for our exclusive Norfolk Today Tour with Baunti Escapes. We had designed a tour which covered over 80 % of the island and included the roofs of Cascade Rd, Two Chimneys Rd, Rooty Hill Rd and Queen Elizabeth ll Lookout, Kingston, Quality Row, Bloody Bridge, Lone Pine and Emily Bay, Mt Pitt with a talk from the Norfolk Island Parks Dept, lunch at Captain Cook memorial, pottery demo from Steve Ryves, gospel singing at St Barnabas Chapel and home via Headstone and Hundred Acre Reserve. We must thank everyone at Baunti for helping us with the tour especially our wonderful drivers, Rachelle and Lynn and Rebecca from The Travel Centre. 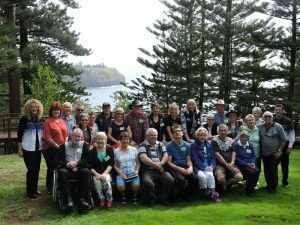 This tour gave the group a taste of Norfolk Island and what it has to offer. Tuesday morning was our usual mini golf competition with everyone enjoying a fun and hilarious morning and getting into the team spirit. A lovely morning tea was once again supplied by Agnes and her team. We hope everyone enjoyed receiving our new cd “The Best of Annette and Kim” and the commemorative 10th anniversary plaque made from native Norfolk Pine in their gift packs. Congratulations to David Krebs the individual winner on the day and also to Elaine Mitchell and Elain Foster 2nd and 3rd respectively. Tuesday evening we were all taken to the South Pacific Resort for the Island Fish Fry due to the possibility of inclement weather at Puppy’s Point. Entertainment was provided by Pitcairn descendant, Trent Christian, with a dance demo by the Tahitian dancers. Plenty of fish was supplied for the evening dinner with no one going hungry. Full tummies all round. Wednesday and Thursday were free days for the group to explore the island and for those with passes to join in with the NICMA activities. Those that wished to joined Annette and I at the RSL for our Wednesday twilight gig did so before heading off to the Trans-Tasman EOY Awards which we will cover later. Friday we were all booked in for lunch at the RSL where Annette and I entertained once again. We would like to thank Terence and his staff at the RSL for their great work and for inviting us to perform. Thank you also to all the local islanders that came to hear us. Over the years we have built a great friendship with many of the locals and we really do appreciate your support. Playing at the RSL also gives us a chance to catch up with some of our Aussie friends that we only get to see at the festival or when we venture to some of the Australian festivals. Friday evening was our farewell dinner at the pirate themed Jolly Roger restaurant with entertainment by Craig Stewart. 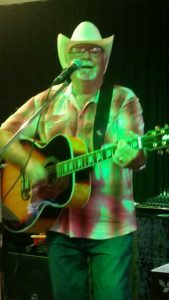 Craig writes a lot of bush ballads and is a regular performer at many Australian festivals. The ship and the evening was well run by a young friend of ours Sophie Harris and her team. It was an awesome way to finish the week. Saturday morning was again a free morning for the group with a couple of them taking advantage of the Pitcairn Settlers Village tour option. The afternoon saw us all gather at the Crown Motel departure lounge, kindly supplied by Wendy and Lee, for a wine and cheese afternoon and a bit of a wind down and group sing a long after a very busy week. It was also time to say goodbye to our Aussie friends, Doreen and Colin, who were heading back to Australia on the Brisbane flight. The rest of us would head back home on Sunday morning. NICMA had organised a full week of music for all attending the festival. Monday evening was the NZ showcase with Headliner, Jody Direen, supported by Midnite Special (Lex and Michelle Greaves and Robert Katipa jr ), Kelvin Cummings 2016 Trans-Tasman winner and Laura Lowe 2016 Intermediate NZCMA Entertainer of the Year. With backing by the Huckleberries and Echo in Harmony who also handled the M.C. duties. Tuesday evening was the Aussie showcase with Headliner Shane Nicholson and featuring Georgia White, Drew McAlister and Warren H Williams And Dani Young backed by Tonally Functional featuring the amazing Michel Rose on Pedal Steel. The show was M.Ced by Aussie duo Nielly Rich. Wednesday was the gospel show held at All Saints Church Kingston for platinum and gold pass holders which featured most of the contracted artists and which Annette and I were kindly asked to perform on. This gave us a chance to try out some of the songs we would like to record on a Gospel album at some stage. Wednesday evening was the ever popular Trans-Tasman competition. All the competitors did a great job with the winner on the night being Mason Hope from Australia with runner up going to Kiwi Keith Pereira. Next year will be the 25th anniversary of the festival so don’t be late booking if you wish to celebrate this milestone. Annette and I will also be taking a tour to Norfolk Island in January 2018. 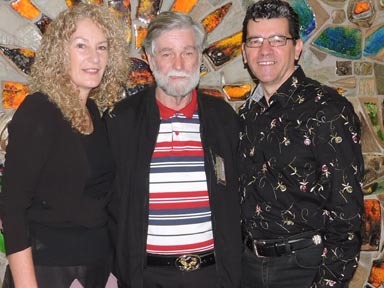 This is the “Count Us In” Music Tour with Alan and Maureen Webster from Australia. It’s going to be a great week of music and mayhem so don’t delay if you want to join us for this tour. Norfolk Air will be chartering a direct flight for Kiwi travellers. Please contact us if you would like a tour package or go to our web page to view the package. 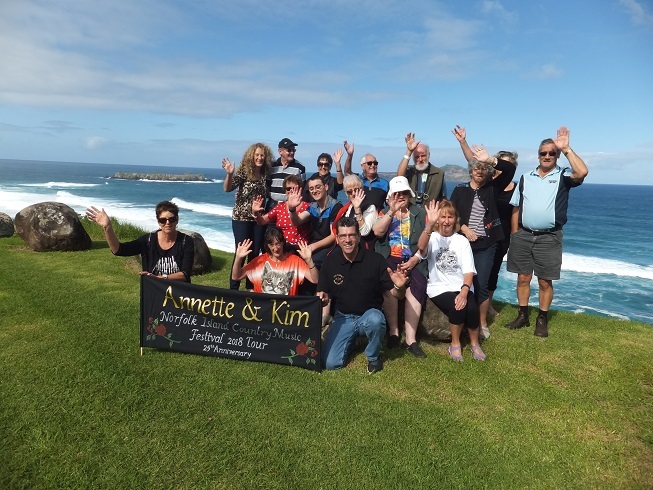 Once again thank you to everyone that joined us on Norfolk Island for our 10th tour. We hope you had a great time and enjoyed the island and the many wonderful things it has to offer. We look forward to catching up with you all somewhere sometime on our country music journey. Take care and keep it country. We had the pleasure of being part of a fantastic concert on Sunday the 26th February. Far North District mayor John Carter QSO was master of ceremonies for the Bay of Islands Vintage Railway Trusts Concert at the Station fundraiser held in the Big Green Shed opposite the Kawakawa Vintage Railway Station. A unique musical bonanza of local talent put on an awesome afternoon of entertainment for a large and appreciative audience. First up were Kerikeri’s ladies barbershop harmony group and regular performers at the Railway concerts Bella A Cappella recent award winners at the Sweet Adelines competition performing Railway related songs in perfect harmony. Ellen Callister born in Kerikeri, but now residing in Auckland, is an accomplished young Opera singer with a lovely voice who performed a number of classic opera and pop opera arias including “Think of Me” from Phantom of the Opera and a touching rendition of “Hine E Hine”. Ellen was accompanied by her mum on keyboards and harp. 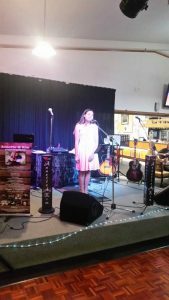 Australian born, South African raised and now Bay of Islands local Shavonne Aliphon is an up and coming young country singer who specialises in performing traditional country music and original songs. Shavonne left the crowd wanting more. Following Shavonne were local group Tambo who play Celtic jazz a mix of 70’s and 80’s rock and folk music. This was an infectious blend of styles and had the crowd humming. Next was Moerewa local girl Zoe King singing rhythm and blues to keep the crowd going and performing a great blues version of the George Jones country standard “Tennessee Whiskey”. Thanks to Alexander for doing a great job on sound as always. Also a big thank you to Shirley for inviting us to perform, all the volunteers that helped out on the day and who give so much of their time to keep these old trains running. And finally to all those that came along on the day to support the concert and help to raise over $2000-00 for the Vintage Railway Trust. We hope to see you all again next year.